It is 6am, you are wearing your fluorescent green bathrobe to let your dog out for his morning duties. You tip your coffee cup up to take a sip…look up…and he is GONE. You wander the neighborhood in your early morning attire yelling and trying NOT to wake the neighbors. DON’T LET THIS HAPPEN TO YOU! Take our 4 week Come When Called class as a refresher or as an intro to this crucial life lesson. 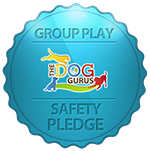 We will work through distracting environments and teach you how to go through the steps of teaching your dog to “COME”! !